Revenues are climbing consistently across the video game industry but in the seasonal business, some publishers are struggling more than others to wring profits from the windfall this summer. Activision Blizzard, the newly minted combination of Activision and Vivendi Games, isn’t having as much of a problem. With franchises like Guitar Hero pushing sales, the company announced strong earnings result Thursday for Activision’s last quarter of independence. They also revealed a joint venture with Logitech to create new controllers for the next installment of the music game franchise. For the quarter, the Santa Monica based Activision said standalone net income increased to $59m or 18 cents a share, more than double last year’s $27.8m draw for the same period. Less expenses related to the merger and stock compensation, the result would have tripled to $74.3m. Sales were up 32% to $654.2m. Wall Street expectations were for $598.1m. CEO Bobby Kotick said the results were the company’s best ever for a non-holiday period. (Note: Activision’s merger with Vivendi Games didn’t formally close until July 9th. The numbers, as a result, were reported on a standalone basis. If the Vivendi Games unit had been included (that data was released on July 24th) it would have added another $347.8m in revenue. The combined total would be enough to make Activision Blizzard the largest independent publisher on a gross revenue basis. Electronic Arts, at number two, drew $804m in revenue). For the September quarter, the combined Activision Blizzard expects net revenues of $636 million and a loss per diluted share of $0.26. Adjusted to exclude the impact of equity-based compensation expense ($0.04 per share), the impact of the operating losses resulting from Vivendi Games businesses that the company intends to dispose of or exit ($0.06 per share), one-time costs related to merger ($0.18 per share), and amortization. The company projects non-GAAP earnings of $0.08 per diluted share. For the December quarter 2008, Activision Blizzard expects net revenues of $1.85 billion and earnings per diluted share of $0.11. Excluding changes in deferred net revenue accounting to address those games with significant online components, non-GAAP net revenue of $2.3 billion is expected. Overall, the picture ahead looks reasonably positive. Software sales industry wide are expected to grow around 24% this year. 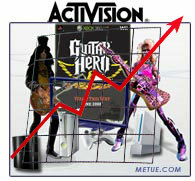 For the rest of 2008, Activision Blizzard expects hardware sales to increase handsomely. They project a 4-5m unit increase for the PS2, an 8 million increase for Sony’s PS3, a 6-7m increase for the Xbox 360, a 15m unit increase for the Wii and more than 24 million portables (PSP and DS combined). The next generation of Guitar Hero, Guitar Hero: World Tour (Guitar Hero IV), should be a part of that boom. The game, which is expected to debut on all of the consoles at some time in the fall, will expand the franchise from Guitars to other instruments (similar to MTV/EA’s Rock Band title). To support that expansion, Activision has partnered with Logitech to produce a series of new premium controllers. There will be newly designed guitars, a drum kit and a microphone component. •Publishing accounted for 88% of net revenues. Distribution delivered 12%. •By platform, consoles accounted for 69% of publishing revenue. Portables accounted for 16% and PC titles just 3%. Console distribution drew 9% and hand held distribution 3%. •At the individual hardware level, the PS3 represented 15% of net revenue, the PS2 19%. The Xbox 360 and Wii each represented 22%. •As of June 30th, on a standalone basis, Activision had $1.25b in cash on hand.